An Act to promote the national security by providing for a Secretary of Defense; for a National Military Establishment; for a Department of the Army, a Department of the Navy, a Department of the Air Force; and for the coordination of the activities of the National Military Establishment with other departments and agencies of the Government concerned with the national security. The Act merged the Department of War (renamed as the Department of the Army) and the Department of the Navy into the National Military Establishment (NME), headed by the Secretary of Defense. It also created the Department of the Air Force and the United States Air Force, which separated the Army Air Forces into its own service. It also protected the Marine Corps as an independent service, under the Department of the Navy. Aside from the military reorganization, the act established the National Security Council and the Central Intelligence Agency, the U.S.'s first peacetime non-military intelligence agency. The National Security Act of 1947 was a major restructuring of the United States government's military and intelligence agencies following World War II. The act and its changes, along with the Truman Doctrine and the Marshall Plan, were major components of the Truman administration's Cold War strategy. The bill signing took place aboard Truman's VC-54C presidential aircraft Sacred Cow, the first aircraft used for the role of Air Force One. The majority of the provisions of the Act took effect on September 18, 1947, the day after the Senate confirmed James Forrestal as the first Secretary of Defense. His power was initially limited and it was difficult for him to exercise the authority to make his office effective. This was later changed in the amendment to the act in 1949, creating what was to be the Department of Defense. The Act merged the Department of War (renamed as the Department of the Army) and the Department of the Navy into the National Military Establishment (NME), headed by the Secretary of Defense. It also created the Department of the Air Force, which separated the Army Air Forces into its own service. It also protected the Marine Corps as an independent service, under the Department of the Navy. Initially, each of the three service secretaries maintained quasi-cabinet status, but the act was amended on August 10, 1949, to ensure their subordination to the Secretary of Defense. At the same time, the NME was renamed as the Department of Defense. The purpose was to unify the Army, Navy, and Air Force into a federated structure. The Joint Chiefs of Staff was officially established under Title II, Section 211 of the original National Security Act of 1947 before Sections 209–214 of Title II were repealed by the law enacting Title 10 and Title 32, United States Code (Act of August 10, 1956, 70A Stat. 676) to replace them. Aside from the military reorganization, the act established the National Security Council, a central place of coordination for national security policy in the executive branch, and the Central Intelligence Agency, the U.S.'s first peacetime intelligence agency. The council's function was to advise the president on domestic, foreign, and military policies, and to ensure cooperation between the various military and intelligence agencies. President Truman signs the National Security Act Amendment of 1949 in the Oval Office. Seal of National Military Establishment (1947–1949), which was later renamed the Department of Defense. President Truman signed the National Security Act of 1947 onboard this VC-54C Presidential transport, the first aircraft used for the role of Air Force One. 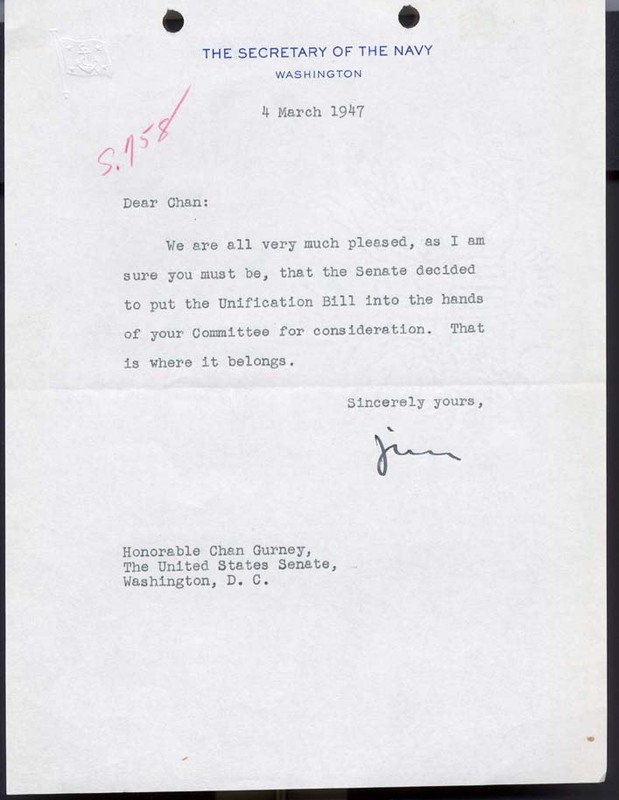 ^ a b "Letter from James Forrestal to Chan Gurney". Committee on Armed Services, Records of the U.S. Senate. U.S. National Archives and Records Administration. March 4, 1947. ^ Kinnard, Douglas. "The Secretary of Defense in Retrospect." The Secretary of Defense. Lexington: University of Kentucky, 1980. 192-93. Print. ^ a b Cambone, Stephen A. "The National Security Act of 1947– 26 July 1947." A New Structure for National Security Policy Planning. Washington, D.C.: CSIS, 1998. 228-32. Print. ^ "USC : Title 10 - ARMED FORCES | LII / Legal Information Institute". Law.cornell.edu. Retrieved September 18, 2012. ^ "USC : Title 32 - NATIONAL GUARD | LII / Legal Information Institute". Law.cornell.edu. Retrieved September 18, 2012. McFarland, Keith D. "The 1949 Revolt of the Admirals." Parameters 11.2 (1981): 53+. Stevenson, Charles A. "Underlying assumptions of the National Security Act of 1947." Joint Force Quarterly 48.1 (2008): 129-133. Trager, Frank N. "The National Security Act of 1947: Its Thirtieth Anniversary." Air University Review, November–December (1977). "National Security Act of 1947". Enrolled Acts and Resolutions of Congress, compiled 1789 - 2008. U.S. National Archives and Records Administration. July 26, 1947.